Get the desktop experience from your handset; simply plug your phone into the DeX Station to use apps, review documents and set or check notifications on a desktop interface. Some things are just easier on a desktop, like sending an email, bolding text, or copying and pasting between apps. With Samsung DeX, it can be done with a click of a mouse or a punch of a key. Your phone is still a phone, even when it’s plugged into the DeX Station. Phone calls, text messages and settings are all accessible from the taskbar on your monitor. Remotely Access Virtual Windows machine via VDI(Virtual Desktop Infrastructure) solutions such as Citrix Receiver, VMware Horizon Client and Amazon WorkSpaces. 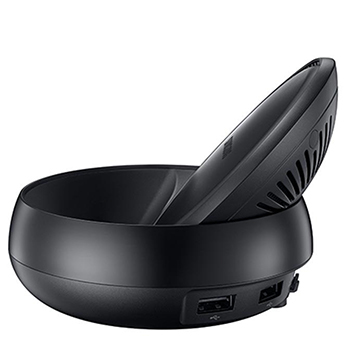 The DeX dock supports Ethernet, HDMI, USB 2.0 and USB Type C ports.